Historically, patients with concussions were told to rest, rest, rest. And when that didn’t work, they were told to rest some more. The research on concussions is evolving at an exponential rate and we are realizing that prolonged rest not only doesn’t work; it can actually make you worse. Sadly, many healthcare practitioners are not keeping up with the explosion in concussion research and are still telling their patients that the only treatment for concussion is rest. If you have fallen victim to this, you don’t need more rest; you need a second opinion. So, if you have been resting for more than a week or two, and are still having significant symptoms, it’s time to switch it up. More rest is likely contributing to your ongoing symptoms. If not rest, then what? Following concussion, animal (and many human) studies have demonstrated a reduction in blood flow to the brain in the early stages. Recent research has found that these blood flow changes may persist for some time following injury.1,6-8 This may be why you are feeling okay when completely resting, but have an increase in your symptoms as soon as you try to walk up a flight of steps, go to work, or read a book. The good news is that this problem can be tested for and rehabilitated very easily; provided you know what you’re doing! The rehabilitation for this problem actually goes against conventional thought: exercise! It is important to see someone who knows exactly what they are doing with this protocol. Testing with a trained professional must be done first to establish set points as well as your specific program. With every concussion, there is also a whiplash. What becomes even more confusing is that the signs and symptoms of whiplash and neck dysfunction are the exact same as concussion!33 Headaches,34,35 cognitive and emotional problems,36 balance problems and dizziness,37-42 eye movement control problems,37 and brain blood flow abnormalities43 have all been shown to occur in whiplash and neck pain patients. There is actually no way to tell if the symptoms are coming from your neck or from your concussion except with testing (some specific tests that we won’t go into here). In fact, most of the patients healthcare practitioners see in this category don’t even report any neck pain, which makes this all the more confusing for practitioners. In a recent unpublished study with the University of Buffalo, the researchers found that there was absolutely no difference in the symptoms that whiplash patients report and the symptoms that concussion patients report. Concussion is an injury that typically resolves quite quickly in most people (symptoms generally disappear for 80-90% of patients within 7 to 10 days); however, whiplash symptoms can linger for up to a year or more. Concussion results in a metabolic dysfunction (read: energy deficit) in the initial stages, which is why rest is important early on; anything that burns energy, such as thinking or physical activity, can increase symptoms. It is important to note however that the majority of studies examining this metabolic disruption show a recovery between 22 and 45 days after injury.15-17 In other words, beyond a 3-6 week period there is little metabolic explanation for your symptoms; unless of course you did not rest in the initial stages and/or received a second concussion soon after the first. Treatment options for both of these things can include simple dietary changes such as avoiding pro-inflammatory foods (red meats, refined sugars, white breads and pastas, artificial sweeteners) and replacing them with healthier options such as fruits and vegetables, fresh caught fish (salmon, mackerel, herring), and good fats (coconut oil, flax seed, almonds). These changes may help to offset an ongoing inflammatory response and reduce your symptoms. Although still in it’s infancy, there is increasing support for various supplements such as Omega-3 fatty acids, creatine, curcumin, magnesium glycinate, and melatonin.18-24 Please speak with your healthcare professional prior to starting on any supplements as there can occasionally be adverse effects and/or interactions with other medications that you may be taking. Another option would be to speak to your doctor about a short course of anti-inflammatory medications. Note that we say “short course” as, over a prolonged period, these medications can begin to harm your stomach and gut leading to ulcers. Dizziness is one of the most common ongoing complaints of patients with persistent symptoms. This may be due to a number of overlapping issues such as problems with the balance centres of your brain, your visual system, and/or problems with the muscle and joint sensors of your neck. Visual system problems may also be one of the causes of ongoing cognitive complaints such as trouble with concentration and/or memory. If you find yourself reading a passage and then having to re-read it several times before you understand what it is saying, you might have a problem with how your eyes are moving or working together. Testing for each of these areas requires extensive knowledge of each of the systems and how they may interact. If you have not had extensive testing of these systems, then you are in the wrong place! Following a thorough assessment of these areas a proper rehabilitation program can be set up. The research on rehabilitation for these areas is extensive with numerous studies showing resolution of dizziness,25-27 and visual abnormalities28,29 with a fairly short course of treatment. It has been well established that patients with a pre-existing history of depression and/or anxiety tend to have prolonged symptoms. Not only that, the symptoms of these and other mental health conditions can result in, or mimic, the same symptoms of concussion (dizziness, mental confusion, concentration problems, sadness, emotional outbursts). Many of these issues can begin before or after the concussion, which may be due to the concussion itself, or a direct result of being mismanaged by someone giving you improper advice. In other words, being told to sit in a dark room, avoid all social contact, not go to work or school, and not do any physical activity for months on end may be causing to the very anxiety, depression, and symptoms that you are attempting to stop. 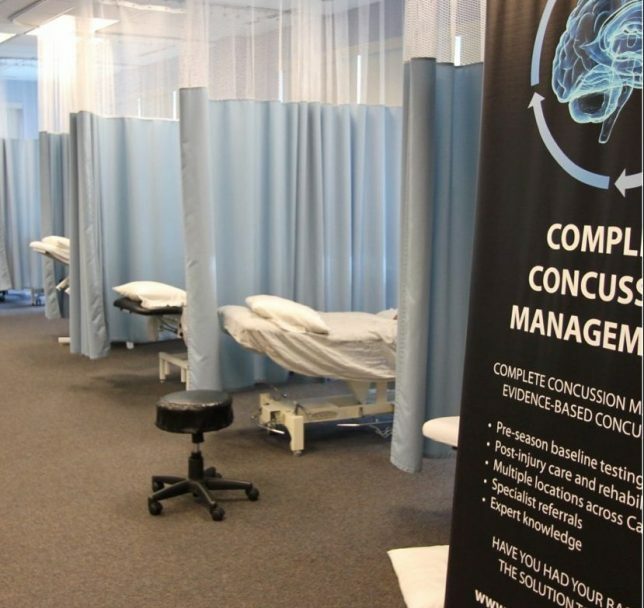 Studies examining the overlay of mental health and concussion are endless (so much so that I won’t even begin to start referencing them), and mental health will always be a big part of concussion management. In most cases, patients often feel much better following some education and reassurance. The Ontario Neurotrauma Foundation recently demonstrated to be one of the best evidence-based treatment options for preventing long-term symptoms was patient education and reassurance! Hopefully, reading this article has even made you feel better about your condition. In more serious cases you may need to see a psychologist, psychiatrist, or other mental health professional such as a social worker. If you feel that you are depressed or hopeless, please talk to your doctor or seek the help of a mental health professional! There is help out there! The trick is finding the right clinic, practitioner, or team that can help you. Click here to find a clinic and trained healthcare practitioner near you! In this episode, we discussed the top 5 causes of persistent concussion symptoms and how to manage complex patients. Leddy JJJ, Kozlowski KK, Fung MM, Pendergast DRD, Willer BB. Regulatory and autoregulatory physiological dysfunction as a primary characteristic of post concussion syndrome: implications for treatment. NeuroRehabilitation. 2007 Jan 1;22(3):199–205. McCrory P, Meeuwisse WH, Aubry M, Cantu B, Dvorak J, Echemendia RJ, et al. Consensus statement on concussion in sport: the 4th International Conference on Concussion in Sport held in Zurich, November 2012. British Journal of Sports Medicine. 2013 Mar 11;47(5):250–8. Thomas DG, Apps JN, Hoffmann RG, McCrea M, Hammeke T. Benefits of Strict Rest After Acute Concussion: A Randomized Controlled Trial. PEDIATRICS. 2015 Jan 5. Moor HM, Eisenhauer RC, Killian KD. THE RELATIONSHIP BETWEEN ADHERENCE BEHAVIORS AND RECOVERY TIME IN ADOLESCENTS AFTER A SPORTS‐RELATED CONCUSSION: AN …. … journal of sports …. 2015. DiFazio M, Silverberg ND, Kirkwood MW, Bernier R, Iverson GL. Prolonged Activity Restriction After Concussion: Are We Worsening Outcomes? Clinical Pediatrics. 2015 Jun 29. Bartnik-Olson BL, Holshouser B, Wang H, Grube M, Tong K, Wong V, et al. Impaired Neurovascular Unit Function Contributes to Persistent Symptoms after Concussion: a Pilot Study. Journal of Neurotrauma. 2014 Apr 15;:140415102712004. Len TK, Neary JP. Cerebrovascular pathophysiology following mild traumatic brain injury. Clinical Physiology and Functional Imaging. 2010 Nov 15;:no–no. Lin C-M, Tseng Y-C, Hsu H-L, Chen C-J, Chen DY-T, Yan F-X, et al. Arterial Spin Labeling Perfusion Study in the Patients with Subacute Mild Traumatic Brain Injury. Hendrikse J, editor. PLoS ONE. 2016 Feb 12;11(2):e0149109. Baker JG, Freitas MS, Leddy JJ, Kozlowski KF, Willer BS. Return to Full Functioning after Graded Exercise Assessment and Progressive Exercise Treatment of Postconcussion Syndrome. Rehabilitation Research and Practice. 2012;2012:1–7. Leddy JJ, Cox JL, Baker JG, Wack DS, Pendergast DR, Zivadinov R, et al. Exercise Treatment for Postconcussion Syndrome. Journal of Head Trauma Rehabilitation. 2013;28(4):241–9. Leddy JJ, Kozlowski K, Donnelly JP, Pendergast DR, Epstein LH, Willer B. A preliminary study of subsymptom threshold exercise training for refractory post-concussion syndrome. Clin J Sport Med [Internet]. 2010 Jan 1;20(1):21–7. Macolino CM, Daiutolo BV, Tyburski AL, Elliot MB. Inflammation in the pain pathway in a model of mild closed head injury: Implications for post-concussion headache. 2014. Lafrenaye AD, Todani M, Walker SA, Povlishock JT. Microglia processes associate with diffusely injured axons following mild traumatic brain injury in the micro pig. Journal of Neuroinflammation; 2015 Oct 27;:1–15. Patterson ZR. Understanding the neuroinflammatory response following concussion to develop treatment strategies. 2012 Dec 18;:1–10. Vagnozzi R, Signoretti S, Cristofori L, Alessandrini F, Floris R, Isgro E, et al. Assessment of metabolic brain damage and recovery following mild traumatic brain injury: a multicentre, proton magnetic resonance spectroscopic study in concussed patients. Brain. 2010 Oct 28;133(11):3232–42. Vagnozzi RR, Signoretti SS, Tavazzi BB, Floris RR, Ludovici AA, Marziali SS, et al. Temporal window of metabolic brain vulnerability to concussion: a pilot 1H-magnetic resonance spectroscopic study in concussed athletes–part III. CORD Conference Proceedings. 2008 Jun 1;62(6):1286–6. Chamard E, Theoret H, Skopelja EN, Forwell LA, Johnson AM, Echlin PS. A prospective study of physician-observed concussion during a varsity university hockey season: metabolic changes in ice hockey players. Part 4 of 4. Neurosurg Focus. 2012 Dec;33(6):E4. Blaylock R, Maroon J. Natural plant products and extracts that reduce immunoexcitotoxicity-associated neurodegeneration and promote repair within the central nervous system. Surg Neurol Int. 2012;3(1):19. Marshall S, Bayley M, McCullagh S, Velikonja D, Berrigan L, Ouchterlony D, et al. Updated clinical practice guidelines for concussion/mild traumatic brain injury and persistent symptoms. Brain Inj. Informa UK Ltd; 2015 Apr 21;00(00):1–13. Sakellaris G, Kotsiou M, Tamiolaki M, Kalostos G, Tsapaki E, Spanaki M, et al. Prevention of Complications Related to Traumatic Brain Injury in Children and Adolescents With Creatine Administration: An Open Label Randomized Pilot Study. The Journal of Trauma: Injury, Infection, and Critical Care. 2006 Aug;61(2):322–9. Sakellaris G, Nasis G, Kotsiou M, Tamiolaki M, Charissis G, Evangeliou A. Prevention of traumatic headache, dizziness and fatigue with creatine administration. A pilot study. Acta Paediatrica. 2007 Dec 3;97(1):31–4. Sharma S, Zhuang Y, Ying Z, Wu A, Gomez-Pinilla F. Dietary curcumin supplementation counteracts reduction in levels of molecules involved in energy homeostasis after brain trauma. Neuroscience. 2009 Jul;161(4):1037–44. Wu A, Ying Z, Gomez-Pinilla F. Omega-3 Fatty Acids Supplementation Restores Mechanisms that Maintain Brain Homeostasis in Traumatic Brain Injury. Journal of Neurotrauma. 2007 Oct;24(10):1587–95. Schneider KJ, Meeuwisse WH, Nettel-Aguirre A, Barlow K, Boyd L, Kang J, et al. Cervicovestibular rehabilitation in sport-related concussion: a randomised controlled trial. British Journal of Sports Medicine. 2014 May 22. Alsalaheen BA, Mucha A, Morris LO, Whitney SL, Furman JM, Camiolo-Reddy CE, et al. Vestibular rehabilitation for dizziness and balance disorders after concussion. J Neurol Phys Ther. 2010 Jun;34(2):87–93. Hugentobler JA, Vegh M, Janiszewski B. PHYSICAL THERAPY INTERVENTION STRATEGIES FOR PATIENTS WITH PROLONGED MILD TRAUMATIC BRAIN INJURY SYMPTOMS: A CASE SERIES. … journal of sports …. 2015. Barnett BP, Singman EL. Vision Concerns After Mild Traumatic Brain Injury. Curr Treat Options Neurol. 2015 Jan 27;17(2):5. Yadav NK, Ciuffreda KJ. Effect of binasal occlusion (BNO) and base-in prisms on the visual-evoked potential (VEP) in mild traumatic brain injury (mTBI). Brain Inj. 2014 Jul 24;:1–13. Broglio SP, Surma T, ASHTON-MILLER JA. High School and Collegiate Football Athlete Concussions: A Biomechanical Review. Ann Biomed Eng [Internet]. 2011 Oct 13;40(1):37–46. WO S. Scientific monograph of the Quebec Task Force on Whiplash-Associated Disorders: redefining whiplash and its management. Spine. 1995 Jan 15;20(8 Suppl):1S–73SDO–. Hynes LM, Dickey JP. Is there a relationship between whiplash-associated disorders and concussion in hockey? A preliminary study. Brain Inj. 2006 Jan;20(2):179–88. Leddy JJ, Baker JG, Merchant A. Brain or Strain? Symptoms Alone Do Not Distinguish Physiologic Concussion From Cervical/Vestibular Injury. Clinical Journal of …. 2014. J T. Cervical musculoskeletal dysfunction in post-concussional headache. Cephalalgia. 1994 Jan 1;14(4):273–257. Watanabe TK, Bell KR, Walker WC, Schomer K. Systematic review of interventions for post-traumatic headache. PM&R [Internet]. 2012 Feb;4(2):129–40. Gimse R, Björgen IA, Tjell C, Tyssedal JSL, B K. Reduced cognitive functions in a group of whiplash patients with demonstrated disturbances in the posture control system. Journal of Clinical and Experimental Neuropsychology. 1997 Dec;19(6):838–49. Treleaven J. Sensorimotor disturbances in neck disorders affecting postural stability, head and eye movement control. Manual Therapy [Internet]. 2008 Feb;13(1):2–11. Treleaven J, Jull G, Sterling M. Dizziness and unsteadiness following whiplash injury: characteristic features and relationship with cervical joint position error. J Rehabil Med. 2003 Jan;35(1):36–43. Vuillerme N, Pinsault N. Experimental neck muscle pain impairs standing balance in humans. Exp Brain Res. 2008 Nov 26;192(4):723–9. Ruhe A, Fejer R, Walker B. Altered postural sway in patients suffering from non-specific neck pain and whiplash associated disorder – A systematic review of the literature. Chiropr Man Therap. 2011;19(1):13. Kristjansson E, Treleaven J. Sensorimotor function and dizziness in neck pain: implications for assessment and management. J Orthop Sports Phys Ther. 2009 May;39(5):364–77. Silva AG, Cruz AL. Standing balance in patients with whiplash-associated neck pain and idiopathic neck pain when compared with asymptomatic participants: A systematic review. Physiother Theory Pract. 2012 Apr 20;:1–18. Bakhtadze MA, Vernon H, Karalkin AV, Pasha SP, Tomashevskiy IO, Soave D. Cerebral Perfusion in Patients With Chronic Neck and Upper Back Pain: Preliminary Observations. Journal of Manipulative and Physiological Therapeutics. National University of Health Sciences; 2012 Jan 12;:1–10. Jensen OK, Nielsen FF, Vosmar L. An open study comparing manual therapy with the use of cold packs in the treatment of post-traumatic headache. Cephalalgia. 1990 Oct;10(5):241–50. Marshall CM, Vernon H, Leddy JJ, Baldwin BA. The role of the cervical spine in post-concussion syndrome. Phy Sportsmed. Informa UK, Ltd; 2015; ( ):000–0. Lystad RP, Bell G, Bonnevie-Svendsen M, Carter CV. Manual therapy with and without vestibular rehabilitation for cervicogenic dizziness: a systematic review. Chiropr Man Therap. BioMed Central Ltd; 2011 Sep 18;19(1):21.